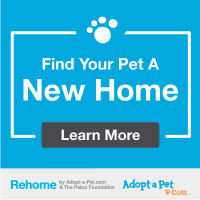 Do you have a pet you would like placed for adoption? Let us H.E.L.P. you by adding your pet to this site. Please click here to access the form which you may fill out to submit the info about your pet with a photo. We always try to conform to your requests but we reserve the right to deny any and all of your requests and to edit or reject any or all text and photos to conform to our standards. We do not accept responsibility for lost submissions. If you are in a hurry and want more exposure than we can give you, please click on the blue button in the right side panel. Adopt-A-Pet will donate your entire fee to us when you use that referral button or mention our name as your referral. Good dog. Needs a lot of attention and we arent home enough. Knows how to use a doggie door and is potty trained. Sparky was adopted as a a playmate for our older dog after she lost her buddy. Unfortunately they are not getting along and we need to find him a home as soon as possible. He is a wonderful 1yr old mix, neutered, UTD on vaccines and microchipped. He is crate trained, knows basic commands and is very well behaved. He has been great with our 10yr old daughter but had not been around kids that are younger. Not sure how he’d be with cats as we haven’t exposed him to cats. Blue Eyes. Shorter hair. Beautiful multi color markings. Very Very loving. Very Chill. Gets along with other cats and is just a joy. No trouble, just likes to be near his loved human. Missy is house, leashed, and crate trained. She is a very sweet dog but has a little anxiety and wants more attention. Best if only dog in Home. I am currently looking at relocating and unfortunately will not be able to take her with me. This is Brandi! She is house broken, great with kids, doesn’t bark (unless there’s someone at the door of course! ), she doesn’t chew on anything (that isn’t hers ). The only thing is, she doesn’t get along with other dogs long term. She LOVES to cuddle, and love belly rubs. No health issues, up to date on all shots. Brandi’s owner passed away while she was boarding at the facility I work for. The only reason I can’t keep her, is because I have dogs and found out she doesn’t like other dogs. She just needs a loving home with no other dogs. Lex is potty trained. We don’t have children so he hasn’t been around them, but he loves people. We have other dogs and he loves going to the dog park but idk how he is with other animals. He loves to cuddle with you on your bed. He can sit, stay, lay down, paw and he is good in a kennel. Kalel is potty trained. We do not have kids so he hasn’t been around them. But he loves people in general. We have other dogs and he loves going to the dog park, I’m not sure how he does with other kinds of animals. He loves car rides and going for a walk. He can stay, sit, and lay down. He is good in a kennel. For more info, please email Zachary Jansen at zaknesnaj764@gmail.com. This little guy was a street cat that came walkin up to my wife and I’s patio one night when he was about 5 months old. His name is Batman. We’ve had him for about a year with our two other cats and our 2 small kids for a year and he’s great. Loves to play with the other cats and is sweet and cuddly with the kids. We cant keep him because of complications with our apartment lease agreement and want to find him a good home. He’s also an attention fiend, is neutered and micro chipped with paperwork for the chip. He is housebroken, good with dogs of all sizes, he is good with children. He does get over excited with balls. *UPDATE* Hobbs has been fostered! He’s a sweet boy who has been introduced to dogs but never another cat. He’d also prefer a home with adults only. Redd, is a house pet, he’s also a vegetarian, he loves snuggling & hugs!, good with kids but has to warm up to some adults, enjoys peanut butter snacks and he is house broken.. I love my baby!, it’s only because I’m a single parent and I also care for my elderly mother who’s health is declining, so all my time & energy goes now to the human family and it’s not fair to my animal family that I can’t give him the same amount of attention..
For more info, please call Dennis at 410 710 7494 or email at dcarter2112@gmail.com. Yoko is very affectionate and likes to snuggle. He is very laid back and gets along with other cats. He never fusses and never scratches. He is so sweet that he comes running anytime he hears a cough to make sure his human is ok. He is an amazing and lovable cat. I have a brindle puppy that needs a good home. He’s active and also kid friendly. My hope is to find a family home with a yard for this loving dog. He was born November 18th, 2017. He’s had a little leash training, but hasn’t had much more training than that. Very smart and very alert. He’s a sweetheart, healthy and happy! For more info, please call Rita at 702-476-2994 or email at sandersrita34@yahoo.com. I hate that I have to rehome Peanut but I have to move and will be living with my son who is very allergic to cats. I got him when he was a kitten so he is around 6 years old and he is neutered. He lived with another cat for 2 years so I know he gets along with other cats. And every time I have visitors he is always very friendly with them. Not sure about small children though because he has never been in contact with them. He is an indoor cat for the most part but does like to sit on the porch sometimes. He never goes any farther than that though. He doesn’t scratch on anything but his scratching post. And honestly I don’t think he’s ever been sick a day in his life. He is completely litter box trained. And he comes with all his stuff- large cat tree, cat carrier, food, litter. He is a very loving cat. He will sit on my lap for hours while I watch tv. Having to get rid of him is honestly the hardest thing I’ve ever had to do so I really need to find a loving home. Please only contact me if you are serious about providing Peanut with a loving home. Thank you. Breed and description: She’s white with brown spots. She’s very sweet. She’s not fully trained. She does know that she has to be outside to use the restroom. She still chews on paper or plastic. She doesn’t bite . She loves to run. She loves to exercise. Flash is a 4 yo, 55 pound, neutered male Vizsla/Lab mix. He is up to date on all vaccinations and is on a wellness plan until October. Flash must be crated when not supervised. He went to a 15 day boot camp for on leash training and knows 10 or more commands. He are fine with children. Please help. My wife and my 2 daughters can not take care of her. I am a truck driver and I am out too long, up to month and a half. She has been with us for a long time. Hercules is a loving cat, good with dogs, lives to be brushed & is spayed. Her elderly owner passed away recently & she is now homeless. She welcomes a loving forever home. Blackie is a very mellow cat, that is neutered, is used to being the only cat, when he was little he was with 1 other cat. Would be best in home with no dogs. We are moving to Hawaii and did not get all the paperwork done in time. *UPDATE* Scarface has found a good home! Zeus is a wonderful dog. Loyal, protective, and loving. Unfortunately, Zeus is no longer a perfect fit for our growing family. He deserves a family that can give him all the love and attention he can get. His name is flash he is a very loving playful boy his only downfall is he doesn’t get along with other animals. He loves to cuddle and play tug-a-war and fetch he will play for hours. He doesn’t do well on walks because he so curious and has so much energy. He is current on his vaccinations and is fixed. He is one and a half. For more info, please call Ronise Herrera at 3233787056. or email at rherrera1@yahoo.com. For more info, please call Hunter Galliher at 702-600-3488 or email at galliherhunter@yahoo.com. He’s a sweet dog, and an amazing pup. He’s very energetic and loves to cuddle, but I work full time and go to college full time. So it’s not fair to him being locked up in a cage all day and not getting the love, care,a and time he needs and deserves. I can’t hold on to him and I don’t want to give him to a kill shelter. He is house trained and knows sit and paw. He is House Trained and knows the basics such as Sit, Down, roll over and two paws up. She is really hyper and friendly. I’m moving to an apartment and it’s not pet friendly so I’m trying to find a good home for her. Placement needed for Neo, a Dog on Hyde Avenue near S. Torrey Pines Drive. Neo is a very sweet, affectionate and loving dog. Great with kids, cats and other dogs. Placement needed for Barky, a Dog in Las Vegas on Hyde Avenue near S. Torrey Pines Drive. Barky is an affectionate, energetic and loving dog. He is a very alert and a good watch dog. Good with kids, other dogs and cats. Rajah is a great little cat, I’ve had her since she was just a few months old. She is very loving and likes a lot of attention. Breed and description: tabby, small, green eyes, orange tinted coat. Found this sweet abandoned cat 1/18 in my complex. She is extremely affectionate, very chatty, found out she is litter box trained, not afraid of new places and just followed me into my apartment. Hoping to find her a good home as I can not keep her. Loves other animals, kids, and his rope. Never has accidents in the house and he will make you feel very protected, as long as you don’t tell anybody he is afraid of his own shadow. They are 2 fixed and chipped females. They were my mom’s dogs and she passed away. My family can no longer keep them due to living arrangements. They have been together since they were tiny babies. We would love to see them go to good homes. Healthy, adorable kittens that teenagers brought home without asking first. Placement needed for Rebel, a rabbit in Green Valley/Henderson Area. We have had Rebel for 2 weeks, after my husband found him/her on UNLV grounds (hence the name). If we find a committed family, we will take care of vet well-check and spaying/neutering. Riley has been great for our family, loving, gentle, and non aggressive. He’s playful and has been great around 4 year old and new born children with love. We got him as a pup 9 years ago in Japan (maybe rare breed). We’re trying to find him a new home because he gets anxious when we’re not home and claws away at the doors and carpet; landlords want him out ASAP. This has happened through 4 homes in 9 years and cost us thousands. Killing him is out of question, but want to find him a new loving home. For more info, please call Taylor at 702-201-9455 or email at tayloradams759@gmail.com. Nikkee was an abandoned kitten from an evicted family within the community; no food no shelter and was following the morning walkers, so I took her on. Nikkee is more like a dog than a cat, she will be by your side and very territorial when it comes to me. She loves to be loved and loves to give love. Nikkee is indoor/outdoor cat, but prefers to stay close to home; not much wandering. As in the other cat posting regarding the HOA issue and the leash law,I am tired of fighting with the HOA and will either have to give Nikkee up or sell my house and move; very hard to do at 65. Jazzee (female) came from a Foster family apparently abandoned and feral. Temp foster for me turned out to be a long-term engagement and partnership. Jazzee is mainly an outdoor cat in an HOA community. Jazzee (Miss Independence) refuses to stay locked up and is a sprayer when she doesn’t get her way. I let her come and go as she pleases; showing up at the door, window or slider, but unfortunately with a leash law for dogs, I can no longer manage her in the confines of the community. Hoping to find a non-HOA setting where she can continue to come and go as she pleases; she is a love bug and I hate to part with her, but it’s either that or sell the house and move; very difficult at age 65. For more info, please call Alissa Iverson at 702-439-7476 or email at iversonalissa@yahoo.com. Placement needed for Faith and Fatboy, Pitbulls in Las Vegas NV. For more info, please call Jonathan at 702-534-9026 or email at calderonjohn78@gmail.com. Very loving animals, wish I could keep them but I’m having another child and there’s just no way !! Please help!! For more info, please call Sierra at 520-975-6597 or email at swaller697@gmail.com. He is not good with other large male dogs. He is newly neutered and wonderful with children and small dogs as well as females. He loves to cuddle and loves being outside. This cat belonged to my roommate, when she moved out she abandoned him here with me. I have two cats of my own and they don’t get along and so he (Blaze) cannot stay here with me. He has been neutered. For more info, please call Ashly Massey at 760-972-9077 or email at ashlymassey@yahoo.com. This little girl is the sweetest cuddle bug, she is 4 years old, with shots, and declawed. She is currently living in a bedroom with just a food bowl, water bowl and cat box. She deserves better and to be with a family that can love her and spend time with her. Someone dropped her on my neighbors door step and that’s the best they can do instead of throwing her in the streets as their family has severe allergies to cats. Please help! *update* This dog has been adopted. This beautiful, full-blooded Shitsu is named Precious. She is 3 years old, spayed and has all her shots. She is a great little dog, she loves people. Cats, kids and other dogs are no problem, she loves everybody. Precious recently had hernia surgery and is waiting at the H.E.L.P. animal shelter to be adopted. We are asking for a generous donation to help defray the costs of her operations and shots. For more info, please call or text Sheri at 702-624-9238. For more info, please call Natalya at 702-285-9643 or email at skinbynatalya1@gmail.com. For more info, please call Coco at 702-601-5896 or email at sole.empire.co@gmail.com. I found him a little over a week ago and have been looking for his owner but no luck. Iv posted on Craigslist and facebook and still no luck. He is very well trained good with dogs, cats and children. I don’t have a place to keep him right now or I would. I’m looking for any other option then to take him to the pound and chance him getting put to sleep. He is a very friendly and well behaved dog. Molly is a very family friendly pup. She’s partially potty trained, but has recently been having an issue with pooping and urinating in her crate. Molly has her rabies shot and 2/3 vaccine sets. I’ve working very hard trying to get her completely potty, but now I’m not going to have the time. My husband and I both work and my son is going back to school. I really want to find her a nice home with very friendly family that’s going to give Molly lots of love and affection. *update* This puppy is already taken. For more info, please call Jessie at 775-315-7989 or email at jessicabuonanno@yahoo.com. Needs a forever home ideal by himself does not like large breed dogs. Very sweet, loves people and kids. For more info, please call Noel at 702-213-0793 or email at nwklepel@yahoo.com. Poor cat was left behind when his owners moved away! He needs a good home! I took him in to be fixed and get rabies shot, also found out he has FIV. He also enjoys car rides so might be a could travel buddy. For more info, please call Jennifer Lehman at 254-319-6668 or email at lehman1721@yahoo.com. I rescued Adele a couple years ago and she has become a part of the family. I really do not want to have to give her up because I lover her truly! I recently moved out to Henderson, NV and I am having a problem finding a place to rent because she is not considered a small dog. I have 2 small children and really need to find a home. Adele is super loving and just a big baby. She deserves more than what I have to offer her at the moment. She is spayed, and up to date on all shots.She just needs a caring home that can give her the attention and time she needs. Stray cat had kittens on June 7, they have been around children and are good with people and other cats. “I had two stray cats that I had started to feed become pregnant. The first mommy abandoned 3 out of 4 of her kittens, which I nursed with kitten formula. I was able to find homes for two of those kittens. There are 2 left. They were born sometime in May. The second mommy had a litter of 7. She has stayed with her kittens. She will also need a home. Her litter was born June 7th. So, that is a total of 9 kittens and 1 mommy cat that need a home ASAP. I am in Glendale, AZ but come to Phoenix, AZ regularly. My friend, Cali, is willing to drive a little bit to help me find homes for these kittens and mommy cat. The kittens have been handled by children, as I have four children myself. All of them have also been around another cat who is a fixed male. The kittens are litter boxed trained and ready to go to a home today. The mommy cat can be described as serious and will most likely do best around 1 or two calm people. She will be okay around other cats. update: The tabby on the right has been adopted. For more info, please call Susan Jackel at 702-812-0999 or email at jackelshm@cox.net. Someone left this sweet girl in a park. She is about a year old, has shots, spayed, and very good manners. I have been caring for her, but it is too much for me to have 2 big dogs in the house. Sophia is a really amazing cat. She is 9 years old and loves people and is incredibly friendly. She unfortunately is not fond of children. She does have all of her claws but does not scratch furniture. She is litter box trained and is spayed. For more info, please call Dana Hinricks at 720-480-7289 or email at Dana.hinricks@gmail.com. This was my parents cat, unfortunately they have passed away and I then inherited her. I am allergic to cats so I can’t keep her. She is a very sweet, loving cat and still likes to play even though she’s no longer a kitten. I believe she has a chip, which I assume the vet could change the information in the chip. Anyway, she’s great company and I want her to have a good loving home. She is ok with other cats, although she is an only pet, she encounters other cats outside who hang out sometimes. She is mainly an indoor cat who likes to go outdoors once a day for a bit. She is afraid of dogs and hasn’t had but two encounters with dogs. She might gain trust of any dog you might have over time, but I can’t say for sure. I think a no dog household would be best for her. If you have a lot of love and attention to give her, please consider adopting her as she will a great and loving companion. Thank you, Dana. For more info, please call Eurayna Hunt at 214-994-6245 or email at EHuntRN@aol.com. Tankk is a loving family house dog. I have had him since he was 6 weeks old. shots up to date, he is neutered. The only reason I have to get rid of him is because I am pregnant and b cause of all the horror stories, I just can’t afford to take any chances with allowing any harm to the baby, although Tankk has been around babies, he’s older and I don’t wanna take any chances. For more info, please call Nazhe at 702-986-5927 or email at nazhestephens@gmail.com. He’s loving kind I just can’t afford him any more. I’m moving and I need to find him a home soon. Please email me. For more info, please call Stephanie at 725-200-8303 or email at jesse.sean86@gmail.com. She is an older cat. My neighbor left her with me, said he would be back for her, but he didn’t. I already have 4 cats and three other animals. Plus my female just had a litter of kittens. She used to being around no more than two other cats. I have a dog and my female keeps getting into tussell’s. I’d like her to be happy in another environment where she feels comfortable to walk around. My animals are to intimidating for her, especially the dog. She may look unhealthy due to her hair loss, but it’s just old age. She’s very sweet and friendly towards people. He is neutered, has lots of energy and is short and very playful. He’s all black with white on his chest and paws. We have 3 chihuahuas so he does have a good attitude around other dogs. Sometimes I swear he thinks he a chihuahua. He love to sleep on the bed with you, he’s just a big bear. Just need a Good home for Bisquit, since my new job & work injury…I haven’t been able to attend to him & he needs a good home! Placement needed for Biggs, a Dog in Las Vegas NV. For more info, please call Bobbi at 801-759-7322 or email at bobbildenney@yahoo.com. Not great with small kids. Age of pet: 2 ? For more info, please call Laurie Shay at 702-493-0350 or email at lms113361@aol.com. My neighbor who lived downstairs from me, moved and left this little cat to fend for itself. I was feeding her. I felt sorry for her, so I took her to my vet, got her spayed, and her shots. She is a cutie. But I am unable to take her in. I am keeping her in my spare bedroom for the time being. I have an older cat with health issues, and its getting very tense here. I am afraid to take her to the animal pound, because I am afraid she would be put down. I just need to find her a home ASAP. Please if you can help me find her a home, I would be forever grateful. I can bring her vet papers and rabies tag as well. She is tri-colored, orange black and white. A very calm quiet dog, Emma is a good companion that will also be a good little watchdog. For more info, please call Mildred at 702-755-4073 or email at littlecrazyhorse31@msn.com. If you happen to want 2 cats, Galaxy’s brother, Namaste, might also be available. Here is a picture of the 2 of them. For more info, please call Kesia Gladney at 702-527-9938 or email at kesiagladney@gmail.com. The tan one is Melo (2yr) and the black and white is Bowzer! They are sweet and gorgeous dogs ! I have a 2 year old and they’ve been in her life since she was 4 mos. I’m moving and can’t take them. They are crate trained and and very lovable! They are inside dogs mostly. They’ve never bite anyone and they love people! We have a lot of functions at our home and they love mingling with the guests. This cat is only affectionate when he wants to be, he will come to you for affection. He is neutered and has his shots. This cat is extremely affectionate, has his shots and is neutered. This Calico cat is very affectionate. She is spayed and has her shots. Calico Cat is nice, she likes affection. She is spayed and has her shots. Bear Bear is neutered, with shots and very sweet. He is good with other dogs and loves to sleep on the bed with you. Shes a very good dog, loves kids and great with small dogs n amazing with kids , she is up to date on shots and is fixed. Breed and description: Short haired / An indoor cat who is the most loving thing in the world. He follows you, sleeps with you, just wants to be pet and given love. Unfortunately he’s not good with other cats but has absolutely NO issue being around friendly dogs. He is neutered, has all his shots, but is not microchipped. I found him on a street when he was about -4 weeks old and took him in and have grown very attached to him and him with me. But the current living situation I am in means I can’t have him right now without him staying locked up in my room all day due to there being 3 other cats. I’m looking for a temporary home for him till I can move out, but if it comes down to it, a good, loving permanent home is what he needs. I need to find him a home ASAP so if you’re interested please contact me! I’d really prefer to find him a temporary home so that I can get him back in a couple months because I am very attached to him. So please consider that when contacting. But I need a loving home to send him to.